St. Anthony parish is the second oldest in the Banja Luka region. The residence was originally in the village Rakovac in 1889, and was named after the village. It was moved to its current place after the construction of the monastery in 1876.? Franciscan friars have assisted at the parish. Three more parishes were separated from this one on the part of the town and suburban settlements. The names of the parishes are: Maria Stella, Budžak and Motike. The parishioners were mainly displaced in the period from 1992 till 1995. The monumental modern parish church was totally destroyed by mines on May 7, 1995, the monastery of Holy Trinity was burned, and the Nestor of the monastery, 80 year-old Franciscan friar fra Alojzije Atlija suffered badly and died under the ruins. He was a tragic victim of the wild Serbian forces. It is worth mentioning that this parish has produced two cardinals at the end of 20th century. These are the deceased Guido Del Mestri, archbishop and diplomat of the Holy See, as well as the archbishop of Sarajevo Archdiocese Vinko Puljić. Both of them were born in the territory of Petrićevac parish. 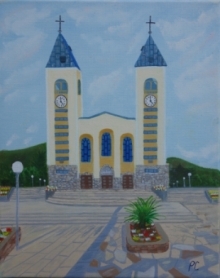 The same parish is the native parish of the current Ordinary of Banja Luka, mons dr Franjo Komarica. Indeed, parish that deserves the every respect! The parish had succursals, in other words small chapels in Vujnovići, Novakovići and Šargovac but all of them were destroyed at nineties of the 20th century. In recent times a very nice wooden chapel was made in Novakovići, alongside the family house of bishop Komarica. FRANCISCANS, named for their founder St. Francis from Assize in Italia, had come to the former Bosnia by the end of 13th century. They had many monasteries in the region of the present Banja Luka Diocese in pre Turkish time: Jajce, Jezero, Greben (Krupa na Vrbasu), Livač (in Lijevče polje), Bihać, Otoka, Livno (in other words Bistrica), the site of the oldest Franciscan monastery in the territory of Bosnia and Herzegovina, and so on. After the destruction of the convents, FRANCISCANS have managed parishes in these areas, as long as there have been believers. Beginning in 1875, Franciscans have managed a monastery in the territory of Banja Luka town on Petrićevac, dedicated to the Holy Trinity. This monastery was destroyed and renovated many times. Although the monastery has suffered in the wars and earthquakes, the monks have succeeded in saving the monastery’s rich library. They are assisting the same named parish and some other friars that assist nearby parishes dwelling in the same monastery.